In a temple in some misty, other-dimensional land, the Queen of Cats approaches the elderly King of the Rats in his throne room. She brings ill-tidings from the rest of the Pantheon; that the King of the Rats has grown too old and now time draws short. They fear he has no time left to choose a worthy successor. On his final breaths, the King of the Rats is forced to agree and wonders if he can find someone in time. Down in the sewer lair, Splinter is meditating when a plague of rats scurries up to him. He can see something troubles them, but before he has time to ask, he is approached by the spiritual form of a man wrapped in bandages, calling himself the Rat King. The Rat King, looking for some action, was drawn to Splinter due to his spiritual and metaphysical prowess. The Rat King baits Splinter to the halls of the Pantheon to engage in battle. The pair hover about the mists for a bit, firing energy blasts at each other, but Splinter is merely toying with the Rat King. Far more skilled in astral battle than his opponent, Splinter, deflects all his attacks, then grows to humongous size; seizing the Rat King in his hand. Splinter then looks into his eyes, searching for the truth behind the Rat King’s power. Some time ago, at a hospital, a young punk (wrapped in bandages after a non-descript accident) escaped from police custody through a window. While making his way through an alley, he was approached by the dying King of the Rats. With no time left to find a worthy heir, he bequeaths his powers to the young man, hoping that he’ll use them wisely. The newly appointed Rat King did not, however, and instead used his newfound mystical talents for personal gain and cheap thrills, letting his “subjects” (the rats) multiply out of control and die without his guidance. The Rat King collapses at this revelation and Splinter promises to help him come to understand the responsibility he has inherited and teach him to be worthy of his crown. The Rat King, however, was merely tricking Splinter into letting his guard down. The Rat King hits Splinter with a telepathic command, freezing the old rat where he stands. Before he can return to Earth and his “less than noble pursuits”, the Queen of Cats and the rest of the Pantheon surround the Rat King. They say they can no longer allow him to use his powers for evil and that he is unworthy of his role. The Queen of Cats frees Splinter from his trance and tells him the purpose of the Pantheon: to watch over the little souls they have been bequeathed to protect. Splinter has vague memories of them from his days as a normal rat; a fact which impresses the Queen. The Queen offers Splinter the chance to become the next King of the Rats, though Splinter is curious about the fate of the Rat King should he take the position. As the Rat King cowers in agony from some severe mental and spiritual strain, the Queen tells Splinter that he will die. Not wanting to cause the death of any living being, no matter how wretched they may be, Splinter declines the honor. The Pantheon backs off from the tormented Rat King, bowing to Splinter’s decision. The Queen then kisses him, informing him that he will have another opportunity to take the role of King of the Rats, but it will be upon his death. Splinter’s spirit then returns to his body and he awakens in his chamber. Fixing a pot of tea, Splinter sits among the rats in the sewer tunnel, having much to contemplate. *It is difficult to place this story. This is Splinters first encounter with the Rat King, so it has to predate TMNT (Vol. 1) #55. The Rat King is permitted to live at the end of this story, so it has to predate Tales of the TMNT (Vol. 1) #4 (it cannot take place after that one, as he’s shown to have died from his shuriken wound in TMNT #55). Splinter is shown living in the sewers. The Turtles were driven from the sewers in TMNT (Vol. 1) #2, forcing this story to occur earlier in the timeline, predating TMNT (Vol. 1) #1. As the Turtles make no appearance, there’s nothing to say they couldn’t be children at the time of this story. 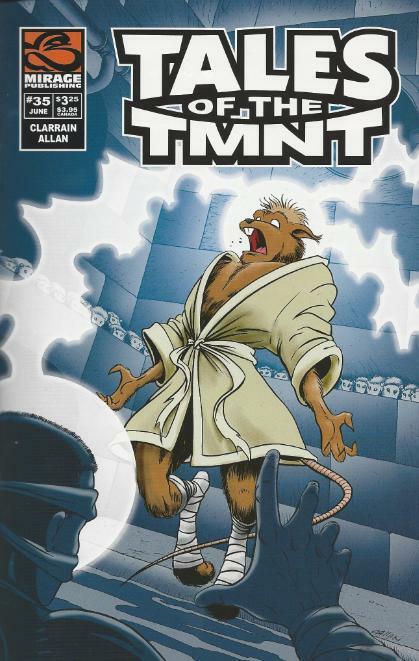 *Splinter previously mastered the art of astral projection in Tales of the TMNT (Vol. 2) #2. *The Turtles will meet the Rat King in Tales of the TMNT (Vol. 1) #4. Splinter will encounter him again in TMNT (Vol. 1) #55. *Splinter’s death will occur in TMNT (Vol. 4) #10. *In case you aren’t a fan of Archie’s TMNT Adventures series, “Dean Clarrain” is a pseudonym used by Mirage staffer Steve Murphy. While my hatred for this story has mellowed over the five years since it was published, I still can’t profess to liking it at all. I’m of the opinion that some origins just don’t need to be told, and the Rat King’s origin was one of them. Part of his allure is his mystique; is he really a mystical entity with power over rodents or is he just an insane bum with multiple personality syndrome? The Mirage series was never explicit in this fact; when he first appeared, he was just a crazy guy whose identity altered with the seasons and only *thought* he was a monster. When he reappeared, it was as a ghost haunting Splinter for several issues, and while that added some mystical credence to his character, it was far from any concrete proof that he was anything more than the ghost of a loony bum. So the decision to pen a definite origin for the Rat King never sat well with me. The end result is something that, for what it is, certainly works in the scope of the universe, the characters and their relationships, explaining the spiritual bond between Splinter and the Rat King, but does so in a way that dilutes the creepy menace of the Rat King with its answers. For its good points, “The Pantheon” is definitely well-researched and ties all of the Rat King’s appearances together with a coherent purpose. His defeat here clearly broke his mind and he was returned to Earth as a harmless bum, no longer having the faculties to exploit his powers (and thus, no longer a threat to the Pantheon). 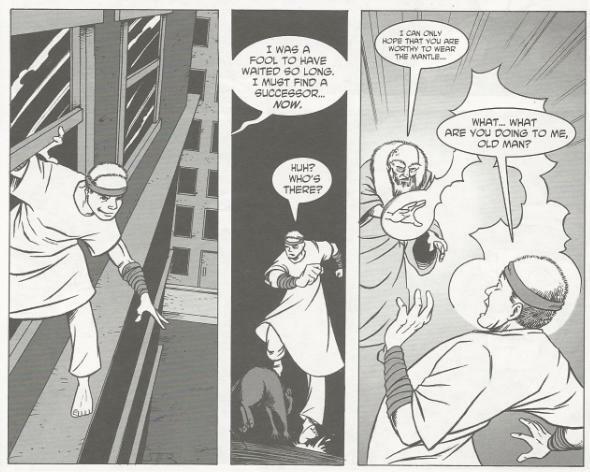 That sets him up for his appearance in Tales #4, where he’s finally done-in by a shuriken to the chest and a fall off a ledge. 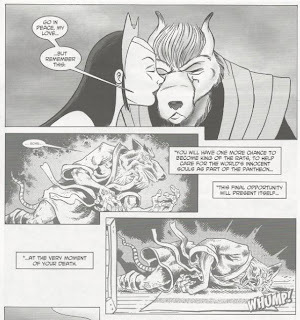 More so than anything else, this story explains his fascination with Splinter and why he spends the remainder of his appearances haunting the old rat, both during “City at War”, then again in “Cold, Cold Ice” and lastly at Splinter’s death in TMNT Vol. 4. We now understand why the Rat King continued to appear to Splinter and his apparition appearing at the time of Splinter’s death gives us a sense of hope, that Splinter’s consciousness would live on as the new King of the Rats, having the position bequeathed to him as prophesied. 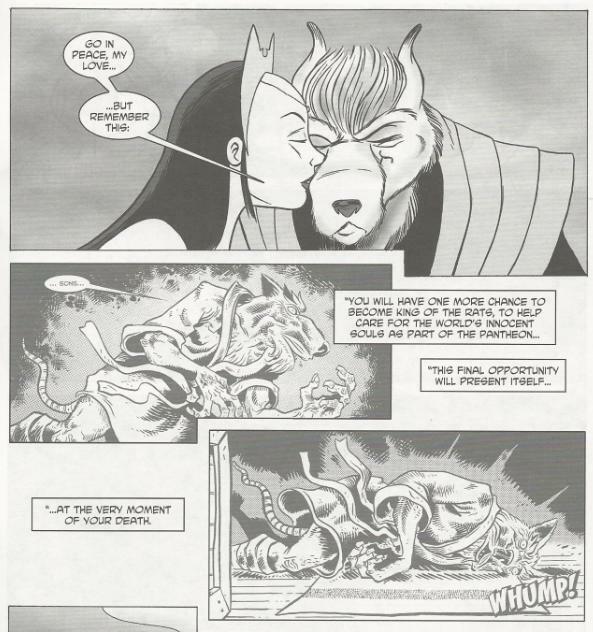 The issue is also very well-drawn by none other than TMNT Adventures artist extraordinaire, Chris Allan. While the sight of Splinter and the Rat King firing kamehamehas at each other and zooming around the sky was silly as hell, it would have looked quite a bit worse had any other artist tried to render it. Allan’s style is probably a bit too “clean” for a gritty and gruesome character like the Rat King, but it actually fit well at this point in the character’s timeline, as the Rat King hadn’t yet fallen into insanity and squalor. And gotta love “Batman” as the King of the Bats in that two-page splash of the Pantheon. As for the Rat King’s origin-itself, disregarding any personal preference for “mystery” over “fact”, I just didn’t care for it. It felt way too much like the origin of Kyle Rayner from the 90s Green Lantern comic (a dying Guardian of the Universe bequeaths the Green Lantern ring to the first human he meets in an alley, hoping they’ll be worthy). Making the Rat King into a juvenile delinquent escaping police custody in a hospital (hence the bandages) felt like a rather shallow means to explain his “evil” disposition. Fact of the matter is, the Rat King was never really “evil” in the first place. In “I, Monster” he was just a crazy guy that thought he was a monster, but was really only a nut in a costume covered in mud. When he returned as a ghost, there was little menace about him; he, in fact, aided Splinter more often than otherwise. Having him be a criminal granted awesome powers who used them for his own gain felt terribly counter to the character. All this being said, I will admit to liking the origin given to him in the 4Kids animated series. As contradictory as that sounds to everything I just said, it worked perfectly fine IN THAT UNIVERSE, continuing a plot thread left open after a previous episode and not undermining the character’s integrity. I’ll surely take “defective cyborg clone of Bishop that’s slowly going insane” over “escaped criminal accidentally given magical animal powers”, at any rate. “The Pantheon” is, to be blunt, a story you could skip and never, ever miss. It serves only to answer the questions nobody asked and take one of the more enigmatic recurring characters of the TMNT series and make him a generic criminal thug. Sometimes, it’s better to leave well-enough alone and the origin of the Rat King should have gone unwritten. I bought this solely for the artwork. 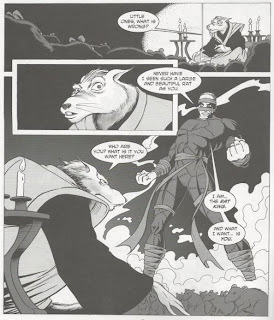 I enjoyed Chris Allan's drawings of Splinter and the Rat King in TMNTA. Thanks for spoiling people who are first-time-reading according to your continuity timeline :p. Thanks to you I knew of Shredders death in advance as well.